Investment advisors and managers to retirement plans provide investment recommendations or take investment discretion. Plan sponsors are encouraged to seek investment advice and management help from advisors when they lack the experience, skill, expertise, and tools to effectively and prudently document an investment strategy like a pro. 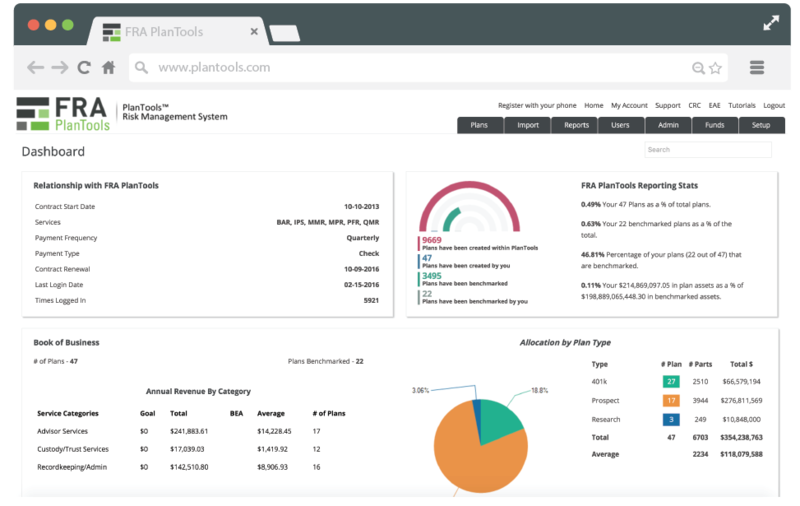 PlanTools Investment Management system is an integrated platform of multiple plan metrics that has been used by advisors since 2002. The system offers over 70 different reporting options. 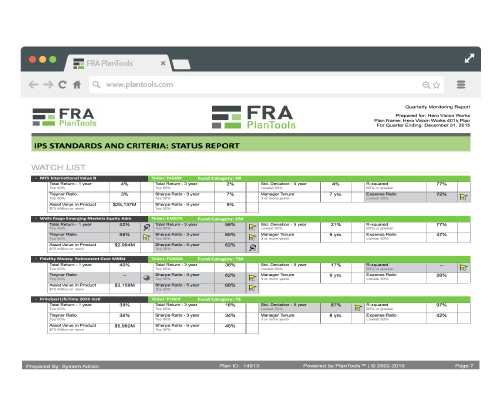 Gain immediate access to PlanTools™ to begin generating over 60+ new reports instantly. Plan Sponsors have a fiduciary obligation to seek the help of experts when expertise is lacking. Nowhere is this more common than in the area of investment monitoring. PlanTools™ provides advisors with the technology to evaluate all universes of funds against 69 different standards & criteria, supporting the comparison to the recommended investments in the Investment Policy Statement quarter by quarter. Thus, providing the plan sponsor with a documented prudent process of all investment recommendations. In addition, templates are available for meeting minutes and client agenda reporting. All of which are available and fully customizable for documenting decisions. PlanTools™ provides an IPS Editor which is fully customizable and integrated within the Quarterly Monitoring Report to provide an easy method of documenting investment selection and monitoring on a quarterly basis. Subscribers can create an unlimited number of IPS templates to address all investment strategies. 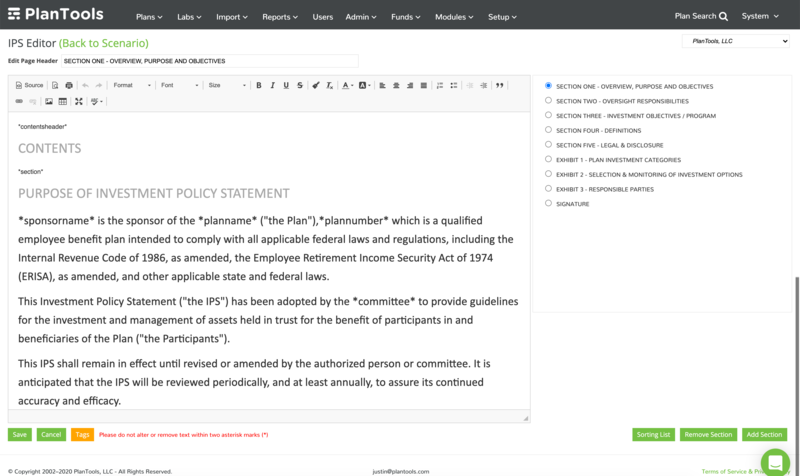 In addition, you have the ability to create an unlimited number of Policy Statements to cater to any plan level requirements. Add images, sections, hot keys and unlimited content to create a streamlined and automated document instantly! PlanTool™ Active vs. 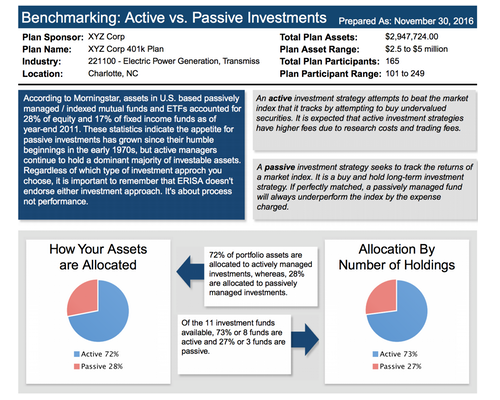 Passive report is a one-page report that identifies the percentage of holdings and assets that provide exposure to passive or index investment options. This report was designed in response to requests from our user groups seeking a clean method to identify the dispersion among the two different investment approaches. Of course, fee compression has impacted every facet of the retirement services industry including investment management fees. This trend has resulted in more plans adopting passive or index funds at the expense of solid performing actively managed investment options in most but not all sub-asset classes. The report is not designed to dictate which approach is better, that is up to the advisor that has been retained. This one-page report will benchmark the plans passive holdings exposure to other plans of similar size and it requires very little information to create the report. PlanTools™ Custom Model solution provides advisors the opportunity to build an unlimited number of models utilizing the advisor's best investment ideas. You can add multiple models to each client. The Model Portfolio report reflects the holdings of each model and the allocation percentage to each holding. Aggregated performance, expense, and revenue sharing are calculated automatically and reflected in the report. The Client Resource Center™ ("CRC") is PlanTools’ proprietary fiduciary governance system. CRC may be purchased as a standalone module or integrated within the Investment Management System. In either scenario, the CRC is a micro-site that is integrated into your website. 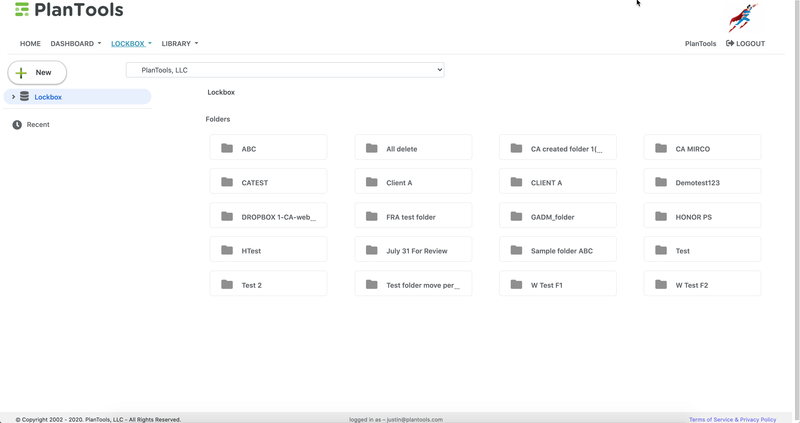 The CRC provides a series of dashboards that provide pertinent plan level information, a document lockbox (fiduciary vault) to hold any and all documents which are stored, an event planner that is tied to a calendar to automate the reporting of specific requirements on specific dates and which is easily retrievable from a centralized secure location, and a robust library of resources that includes statutes, regulations, and industry white papers. Create a plan and instantly have access to over 60+ reports at your finger tips.